Most noteworthy, one of the most beneficial elderly activities includes exercise. Furthermore, regular exercise makes the elderly healthy and strong. Consequently, the elderly will live an active and fulfilling life. Elderly activities such as exercise provides the health benefits listed below. Exercise boosts immune function – body can fight off infection and disease more easily and quickly. In addition exercise leads to better respiratory and cardiovascular function, thereby: a) lowering risk of heart disease; b) stronger lungs and airways and, c) healthy vascular system. 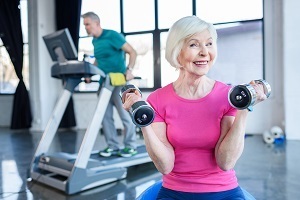 And, exercise results in stronger bones: a) by protecting against bone loss; b) increasing bone density, thereby reducing risk of osteoporosis and lowers risk of falls and broken bones, and; c) resistance exercises dramatically reduces loss of bone mass, restores bones and contributes to better balance and less fractures. Also, exercise improves gastrointestinal function: a) boost metabolism; b) promotes efficient elimination of waste; c) encourages digestive health and; d) treatment for people suffering from slow digestion and constipation. Furthermore, exercise protects against chronic conditions: helps people with dementia and Parkinson's disease maintain their balance and coordination. In addition, exercise decreases mortality and age-related morbidity. Finally, exercise improves balance and reduces fears of falling. Arthritis. Regular elderly activity lubricates the joints and can help reduce overall pain and stiffness that is often experienced by people with arthritis. Heart Disease. Exercising helps manage blood pressure and blood glucose, and decreasing LDL cholesterol. Metabolic Dysfunction (Type 2 Diabetes and obesity). Exercise helps by maintaining proper body weight and help regulate blood glucose as well as insulin levels. Cancer. Studies have shown 30 to 40 % reduction in breast cancer risk among women who perform moderate to regular exercise. Hypertension. Exercise helps lower systolic blood pressure significantly through moderate intensity physical activity. Depression. Exercise has a beneficial effect on personal mood. Studies suggest group exercise classes for seniors reduces symptoms of depression by 30 percent or more. Dementia. A recent study showed a 37 percent reduced risk and a 66 percent reduction in risk of dementia when adults performed moderate intensity exercises. Quality of life: Regular exercise inclusive of strength and balance can help maintain functional independence. Insomnia. Higher levels of elderly activity can help exhaust the body enough to place it in a position for restful and lasting sleep. However, avoid exercising two hours before bed to get these benefits. All-cause mortality. A recent study showed a 30 to 80 percent reduction in all-cause mortality when individuals exercised at an equivalent of four miles per hour. 400 genes in the muscle cells were working differently in those who did interval training three times a week on stationary bikes. The training consisted of pedaling hard for four minutes, resting for three and repeating the sequence three more times. 19 genes in those who did moderate training. They rode stationary bikes at a moderate pace for 30 minutes for a few times a week and lifted weight lightly on other days. Most of all, the interval training participants showed increases in the number and health of their mitochondria. Therefore, interval training corrected the decline in the cellular health of muscles associated with aging. Exercise duration and intensity guidelines from the CDC are provided elsewhere. Most noteworthy, a 2015 study points out that morning elderly activity, such as exercise, increases rapid eye movement (REM) sleep at night by 10%. Also, REM sleep plays a role in learning to let go of fearful memories. On the other hand, elderly activity, such as exercising, late in the evening, results in lower production of melatonin than exercising in the morning. As a matter of fact, melatonin is a hormone made by the pineal gland. And, the pineal gland is found just above the middle of your brain. Furthermore, it tells your body when it’s time to sleep and wake up. Finally, melatonin production affects your circadian rhythm. Especially relevant, changes to the circadian rhythm contributes to stress-induced depression and affect reward pathways. In addition, the circadian rhythm also interacts with your gut bacteria. Furthermore, an imbalance in gut bacteria is associated with stress and anxiety and even insulin resistance. Therefore, restoring healthy gut bacteria helps reduce stress. Most noteworthy, seniors with Alzheimer’s dementia may experience increased confusion and agitation late in the day, as well as increased risk of falling. Therefore, seniors with these symptoms exercise in the morning 2-3 hours after they wake up. Also, some seniors may have symptoms of joint stiffness and pain (especially if they have arthritis, degenerative joint disease, fibromyalgia or gout). When you are asleep your joints are likely to be still. So when you wake up you may feel the stiffness. Therefore, for these seniors, it is beneficial to perform their elderly activities, such as exercising, in the middle of the day or before the afternoon nap (which may cause stiffness after they wake up). In addition, a 2007 American Heart Association report indicated that cardiac events in seniors are more frequent in the morning. If you have cardiac conditions such as a history of heart attack, stroke, peripheral vascular disease or atrial fibrillation, you want to do elderly activities such as aerobic exercise in the afternoon. Finally, strength training is best performed in the afternoon: a) when your joints and muscles are most flexible, or b) if you had a recent injury to your muscles, tendons or ligaments (such as bursitis, muscle sprain or tendonitis). Here are some suggestions to avoid injuries while exercising. Replace running shoes every six months because the compression on the bottom of the shoe breaks down, increasing the likelihood of injury. Stay hydrated, particularly in warmer temperatures, and don’t overdress when the weather turns chilly. Warm up and cool down before and after strenuous physical activity to help your body transition more easily. Stretch to increase flexibility. Don’t bounce while you stretch because this increases the risk of tearing muscle tissue. Gently stretch until the muscle is tight, hold for a count of 10, then release. For increased flexibility, add a yoga class to your exercise regimen. Aerobic Exercises. First of all, aerobic exercises increase your breathing and heart rates. Furthermore, exercising with intensity causes you to sweat. In addition, aerobic exercises keep your brain, heart, lungs, and circulatory systems healthy. Resistance Exercises. Resistance exercises help build muscles. Also, resistance exercises help improve bone density. Flexibility Exercises. Flexibility exercises stretch your muscles and help your body stay limber. Examples of flexibility exercises include shoulder and upper arm stretch, calf stretch, and yoga. Balance Exercises. Balance exercises help prevent falls. Examples include standing on one foot, heel-to-toe walk, and tai chi. Aerobic. 30 minutes each day in order to elevate heart rate and speed up breathing. If tiring is an issue, do three 10 minute periods throughout the day. Cardiorespiratory endurance exercise increases the body’s ability to deliver oxygen and nutrients to tissues and remove waste over sustained periods of time. Strength and Resistance Training. Strength training helps prevent loss of bone mass and improves balance, which helps avoid falls and broken bones. Seniors can do strength training with weights, resistance bands, nautilus machines or by using walls, the floor and furniture for resistance. Bodyweight exercises or calisthenics (lunges, sit-ups, leg raises) are also convenient options. Two or three strength/resistance training workouts a week will provide the greatest benefits. Exercise all muscle groups by doing one or two sets of 10 to 15 repetitions at moderate intensity. Stretching and Flexibility Exercises. Stretching helps muscles warm up and cool down gradually, improves flexibility, prevents injury and reduces muscle soreness and stiffness. Activities like yoga and pilates provide useful stretching and strength training. Exercises that strength core muscles (muscles connecting the inner stomach to the lower back and spine) provide foundation for all movements. Strength in this area encourages better posture and balance and reduce widespread muscle pain. First of all, to keep themselves healthy and strong, seniors participate in elderly activities, such as exercise. Furthermore, the elderly have a choice from four types of exercises: aerobic, strength, flexibility, and balance.